Route 66 of Days Gone By! Back in the day when you traveled Route 66 you saw signs whizzing by you as you looked up from a Sad Sack Comic Book, Dad driving Hell Bent For Leather to the next Motel to get their in time to enjoy the pool. 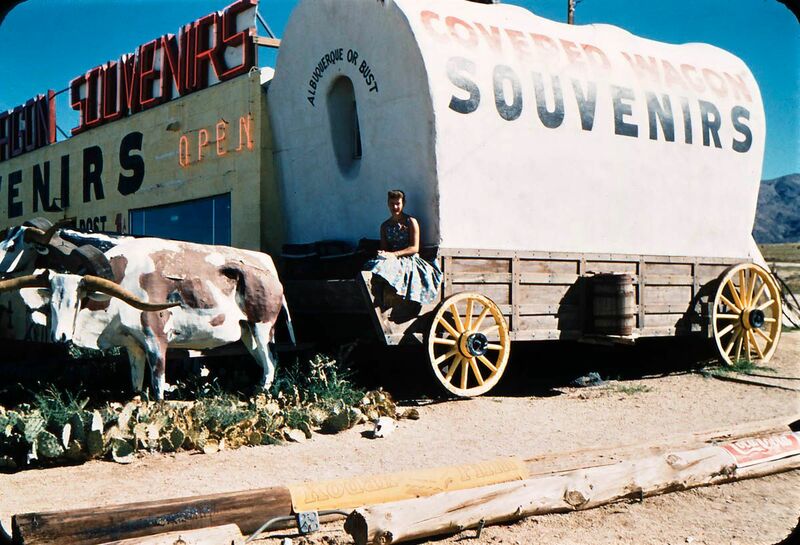 Some of those signs going by or actually you going by them were to places like the Covered Wagon in Albuquerque. A travelling kids delight full of polished rocks, fake arrow heads, Mexican jumping beans and or course the hard rock 'candy'. That Candy would eventually dissolve but it was no more than a hardened Jelly Bean with speckles on it giving the appearance of a rock. Whomever invented those made mint. Who would have thought millions of kids would pay a buck to chew on rocks. Anyway, the tourist trap was great. It was a time to get out of the car, stretch your legs and become an Indiana Jones of sorts, exploring every aisle of the store while your parents fawned over Indian Jewelry or one of the cactus lamps with the photo shades. Sad that kids today won't experience that but they've got Pokemon, not Mexican Jumping Beans to worry about .